I've practice ceremonial magick for 7 years now and I've come to like the simple gestures provided in hoodoo. I also got obsessed with the aesthetic of the oil bottles and charms. In my view, a lot of power seems to derive from the natural energy in a gesture. There is a certain grace and naturalness when you make a knot to close a mojo bag, for example. Oils seem to give off a vibration. But what are the rudimentary skills of Hoodoo? Is there a way to do this? I know cinnamon can be used to heat up love and lust spells? But what about others, like friendship, commanding, influence, etc.? Would Master Key or Power products be useful in this? Power is always a good product. You can also use John the conqueror products to increase your power. Frankincense is a good intensifier, too. Mix it with whatever incense you are using in your work. Thank you for the reply, Natstein. I did think of Power products, but not of JTC. Thank you, Miss Michaele. I forgot about that about frankincense. Hoodoo Herb and Root Magic says to "mix" it with your current incense. Is it okay to just burn it at the same time? I have stick frankincense incense, so is it okay if I just burn that at the same time as whatever other incense I'm using? Hi Luckbewithme876, you can burn the stick alongside if you have no other choice, but I've found it works best if the resin is ground finely and then mixed with powdered incense or herbs. If you have no resin for the moment though, better stick frankincense than no frankincense. How could I forget about lightning-struck wood, Aura! Thank you for mentioning it! LuckBeWithMe, perhaps you could break up your frankincense incense sticks into little bits and mix it with your powdered incense. Try it as an experiment. Adding other products to make a tailor-made combination is definitely one way to "add" to a spell, but products alone do not supply all of what you call "oomph." In hoodoo, we also time our work to take advantage of nature's movements (tides, Moon changes, menstrual cycles, etc.) and we pray into our work, and focus our minds or concentrate on our desires. I have read through many postings and articles here. I'm confused and think I've done things incorrectly. I've been in a relationship with a man for a little over a year now. We've been a little off and on but for the most part we have spent quite some time together. I noticed a waning in his attentions/affection. I started a honey jar using a picture of him and myself with our full names and birth dates. I did not have any personal concerns as I had never collected any and we were "off" around that time. I noticed he did reach out more frequently after I started the honey jar. I've been working it for 3 months now. About a month ago, I started 3 vinegar jars. My understanding is they are to turn a situation around. So, I wrote "X doesn't contact me daily" in one, "X doesn't love me" in another" and " X doesn't want to see me" I used a petition only in the jars. they are in small dresser I have in my closet. Should I shake them? I never have. Do they need that? The ammonia has dried in one of them. There's only a little left and the paper looks bloated in the jar. It has not leaked. All of the jars are on glass "coasters" (for lack of a better name) so I could tell if they were leaking. It's the one I wrote "X doesn't love me" on. The rest are fine. The situation has become worse. He barely contact me now and has taken to respond to me hours later or not at all. this is making me very unhappy. I am in love with this man. He's exactly want I need and want at this point in my life. I'm growing more and more upset about this and I think I've done something wrong. I have ordered some candles be set with MISC and I'm told I should have a candle report by next week. 1) Does the vinegar cancel out the honey jar? 2) Am I doing something wrong? Have I done this incorrectly? 3) Please advise on what you think about the steps I've taken. 4) Do things get worse before they get better? Hello sweetheart I hate your goin through this situation. The honey jar is a good idea, and it seemed to be working based on what you posted so I would keep working it. Maybe add some candle work for love to rein form the jar work. Now as for the vinager/amonia jars, I was taught by my teachers that vinager sours situations, and that amonia is a strong cleanser. The amonia jar seems like it would work to me to cleanse off the "x doesn't love me sitiuation" I have never used it in that way but I don't see why it couldn't be made to work in that way. But the vinager jar I, personally, would stop. Justy personally opinion and way of working. First, i know that you think this is a simple question about a home-made love spell gone wrong, but because of the content, i am moving it to the section on BASIC QUESTIONS ABOUT HOODOO, because it indicates a need for more understanding of the principles upon which our work is founded. Next, i am very sorry, but your questions tell me that you are an exemplar of the old adage that "a little learning can be a dangerous thing." You have confused three types of spells together, simply based on the fact that they are worked inside containers. But the spells are not similar in any other way. In other words, the FORM of the spells may be similar, but the INTENTIONS are widely different. Honey and sugar spells are to SWEETEN those whose names are in the jar. They bring about loving relationships. A petition like "X loves me" in a sugar or or jam jar will bring about sweet love. You may eat from the jar or use the contents in cooking for the one you love. Not all sweetening spells are worked in containers. Vinegar is SOUR. It is to make things unpleasant. Putting names together in a vinegar jar causes the people to dislike one another. A petition like "X doesn't love me" in a vinegar jar will sour and kill the relationship for sure. It is a common practice to shake such jars to encourage fighting and fussing. Not all vinegar spells are worked inside containers. Ammonia is an intense CLEANER and can be used to wipe out old conditions, or turn a situation upside down -- either for good or ill. When using ammonia to flip a scene over, you would turn the jar upside down, which you do not indicate that you did. Ammonia may be added to cleaning scrubs and, as such, not all ammonia spells need be worked inside containers. The title of your post is "Doing both the honey and ammonia jars together?" but you also mention "3 vinegar jars" in which "the ammonia has dried up." Vinegar and ammonia are two entirely different things. 1) Vinegar and honey don't "cancel" each other out, as magic is not a mathematics problem, but each one does completely OPPOSE the other. You are thumb-wrestling yourself. 2) Yes, you are doing something VERY wrong. You have THREE types of container spells going -- honey, vinegar, and ammonia -- and each has a different goal, which means that you are not thinking this thing through and you have a very unclear concept of why people do magic and how magic works. 3) I think you need to respectfully disassemble ALL of your jars -- vinegar, ammonia, and honey -- and then start all over again. Wash them out by hand and release the contents. You have made a real mess of things and you should next take a bath of Hyssop herb brewed in Van Van bath crystals, then strained. This bath is to take off any negative ideation and crossed conditions that have resulted from your crossed-up work. 4) No -- you have created crossed conditions by your form of work, and nothing will get better until you undo and fix this mess. However, before you start any new work, you need to really learn about this art and how we work container spells. I want you to read these THREE web pages, in the order i have set them forth here. The articles start with the most general forms of container spells, continue to specific forms of bottles and jars as containers, and finish with sugar and honey spells (both inside contains and not). I wish you all the luck in the world, and i know you are going to need it, because this is one MESS you have created. I got myself mixed up. I have NOT done any vinegar jars. I have only done honey jar and ammonia spells. The honey jar is to sweeten him toward me. It did this. The ammonia jar is to turn a situation around. I did it in a jar as that was the most stealthy way I could do it and it just felt right to me. I taped my petition to the top portion of the jar with the present situation written on it, added ammonia, covered it and turned it over. I made three of them. There is one that seems to have dried up. The paper is bloated but I know it hasn't leaked. What should I do with that? Is it ok if I wash it out under a running tap in my sink? It's going to be hard to find a river where I live in Texas. but I can do it if need be. the other two are just fine. Do I need to shake them every now and again? Or trash all of them? I figured using both methods toward essentially the same goals would have them work together from different angles. So, they are "clashing" instead? My honey jar has worked. It did sweeten him to me. I have loved and hugged on my honey jar for three months. I have to get rid of it, too? I got my first candle report back today. I ordered, Love ME, Follow Me, and Stay with me, I think for 3 runs. I've also ordered the Intranquilty spell as a very last resort. I haven't received it yet, so that's fine. I did order a money spell as well. I'm going to need that soon as this is getting expensive. ;> It is well worth it to me. He's worth it and I will get it back ten-fold. Hopefully this has clarified some things. Now that I have, do you still advise I do the same as you said before? I"ll do it I just want to be sure... I do love that honey jar. You confusion is leading you into conflicting and irrational choices. You did THREE Ammonia jars? That's what messed you up. Wash them out. Stop them. They are harsh and inapproiate for sweet love. Keep the honey jar if it is still working for you. Now you want to do an Intranquil Spirit spell? Really? Do you love this guy or hate him? Apparently i am not getting through to you here. I wish you could see how unfocussed and chaotic your work looks to me, an old, experienced root doctor. You are attempting to post your candle reports in public, for all to see! I had to delete that mess. Lord, please learn more about how conjure works, how to be a client, how to focus your work on one intention. You would do well to have someone coaching you. Coaching is far cheaper than hiring a conjure worker and it will, hopefully, keep you from buying spells you do not need and should not use. It may also lead you to decide, once and for all, what you really want. Did you read the links i posted? I ordered the Intranquil Spirit spell. I have not received it and I will not use it when I do. I will order the baths. It's pretty clear I need to cleanse myself. ... the candles are being lit so they may help as well. I posted the reports because I've seen others posted and I wanted to give you the full picture. I won't do that again either. I am keeping my honey jar. That is the one spell I have always been clear on and I think I've done well. I saw results and it is easy for me to focus with it. Can I call someone for coaching? Do I seek coaching on these forums? I am now afraid I've ruined any chance I had. Do you think if I just keep working my honey jar and let the candles run their course it will help? What would you suggest I do next? How do I fix it? can it be fixed? I can do the spells, I need to know which ones and when. I am willing to purchase the items needed to work with and to put in the effort required. I dont want to give up. I can't answer all of your questions but I doubt that you have "ruined your chances". You probably just have to start all over again from the very beginning in a calculated mannner. Most of the AIRR members give magical coaching. I had trouble choosing the most appropriate topic for this question so please bare with me. What does it mean when a stranger shakes smoke at you? That is, if it means anything at all. I was walking around the city, I think I was going to CVS, and a woman sitting on the front steps of a building waved something smokey at me. It wasn't tobacco and didn't have much of an odor at all. It was the middle of the day during the work week and other people were passing by, mostly dressed in business attire. I was afraid to turn around & look so I just peeked out of the corner of my eye. This was last autumn & it's probably nothing but for some reason today it's suddenly burning on my mind. I don't remember what the woman looked like, other than she was older & either wearing shorts or a dress because her legs were exposed, and she spoke with an accent as she talked to someone nearby. I do not remember which building it was either. I didn't notice her do this with anyone walking in front of me & I don't know about after. Whatever it was she shook had a handle or something that she held on to and it was brown. This is no big deal, right? And I don't know why I'm suddenly thinking about this so many months later but I'm trying to heal myself after spending a year in the abyss of the bell jar. I am sorry but I don't know what that could have been. I don't know if it was an incense, tobacco, something she was brewing (such as a tea), anything. It just depends what the smoke came from. If she "spoke with an accent" it is unlikely that this event had anything to do with the hoodoo tradition, because hoodoo is African American and we consider regional American ways of speaking to be dialects, not accents. Sorry that I don't have a definitive answer for you. Thank you, Miss Aida. She had no reason to cross me and I am probably just thinking about it too much, but I am going to do an uncrossing bath just to be safe. 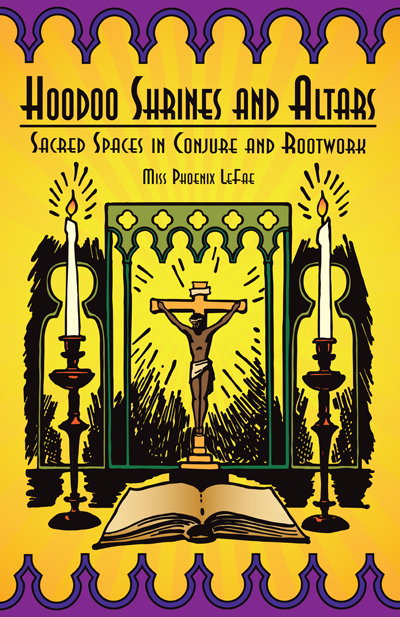 This book is a reprint of one of the earliest treatises on hoodoo that was written by a candle shop owner for the benefit of practitioners. It first came out in 1936. The new edition has been reformatted and re-edited, and it includes both textual material and illustrations that were omitted after the publication of the first edition, making it the most complete available edition ever. 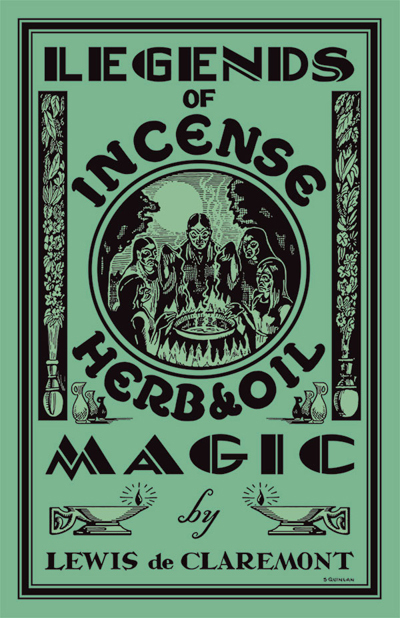 If you want to look at hoodoo as it was practiced 80 years ago -- and STILL is practiced by traditional workers -- check out "Legends of Incense, Herb, and Oil Magic." People told me I should call JC and ask him to open the gateways to my angels, guiding spirits, ancestors and any spirits willing to help in my spell casting.... Is this really how traditional Hoodoo practitioners work? How should I proceed, as I don't wanna change the original way to do it. That's a good question. To begin with, in looking at the history and tradition of hoodoo, you first need to examine your own beliefs and requests. Consider first who told you that some, any, or all hoodoo practitioners "call spirits upon [our] work." The person or persons who told you this comes to hoodoo with a religious beliefs expressed in the form of embedded premises. The overt embedded premise is that "spirits are called into the work." Beneath that is a secondary and covert embedded premise, namely that there are "spirits" (plural) exist who can somehow be "called." This brings into focus a third embedded premise that takes the form of a belief set or cosmology (a theory of the universe) in which "angels, guiding spirits, ancestors and any spirits willing to help" are accessible and can be approached through the agency of Jesus Christ. Now, in truth, many, many hoodoo practitioners would agree with all that is proposed in this cosmology -- but that is by no means the delimiting or defining characteristic of hoodoo practitioners. Remember that hoodoo is folk magic. Not all folks are religious in orientation. Religiousity is a matter of inclination and home training. It functions to a certain extent independently of one's orientation to and home training in folk magic. * Some folks are raised religiously and also learn hoodoo at home and then they break with religion but still practice hoodoo. * Some folks are raised non-religiously and also learn hoodoo at home and never consider hoodoo as connected to religion. * Some folks are raised religiously and never learn hoodoo at home, then find hoodoo and add it to their religious concepts. * Some folks are raised non-religiously, never learn hoodoo at home, then find hoodoo and practice it without a religious context. And all of the above are "traditions" within African American culture. That is, you will find people from all four of those groups in a historical sweep of the professional practitioners whose lives we know about, going back to the 19th century. However, to grant history its due, in earlier times, most people were raised with some religious training and thus their practice of hoodoo is intertwined to a certain extent with the religious expressions in which they were raised. Among Black Americans, the Baptist Church is the predominant denominational group, with other Protestant denominations, like the Methodists and African Methodist Episcopalians, having some strength as well, along with the Holiness, Pentecostal, and Sanctified churches, followed by the Roman Catholics and the varied "new" religions such as Spiritualism, New Thought, and the Black Cultural Nationalism groups of the 19th century and beyond. So ... who carried the tradition of hoodoo? Who developed the tradition? Who maintained the tradition? Mostly Baptists, truth to tell, and therefore, Jesus Christ is definitely a strong figure of spiritual focus. But the Baptists are also known for their love of the so-called "Old Testament" (the Jewish Bible) and, unlike the Catholics, who are all up in their Apostles and Saints, the Baptists often refer in their magical work to figures such as Moses, King David, King Solomon, Daniel, and the Hebrew Children in the Fiery Furnace. So, if you want to follow traditional patterns of a cultural folk magic in which you yourself were not home-taught, the first thing is to align your beliefs with a traditional cosmology of the people whose culture sustains that form of folk magic, to whatever extent you can -- knowing that, as in the four examples i gave above, religious connectivity to folk magic is fluid and variable. Next, honestly asses how much the culture's religious principles will be informing your understanding of the folk magic of the culture. In other words, if you were raised as a Chinese Taoist, to what extent will you invite the Psalms of David or the shedding of Christ's blood to affect your practice of hoodoo? You cant fake it, you know. You have to own it. So ... long story short: My advice is that in order to understand the role of spirits in hoodoo culture (in contradistinction to the role of roots and herbs in hoodoo culture, the role of economic transactionality in hoodoo culture, the role of the divinatory arts in hoodoo culture, et cetera), you will do well to join into mainstream Black American spiritual culture. That's where hoodoo's spirituality originated and that's where its strongest spiritual practitioners still abide. OL SCHOOL GOSPEL MEDLEY - JESUS IS ON THE MAINLINE, TROUBLE IN MY WAY - HATTIESBURG, MS. Thanks a lot miss Cat for this great explanation and for taking your time to do so. I am a pentecostal Christian since I was born, so I would say I consider myself comfortable in working with JC as I've known and venerated Him since I was born. 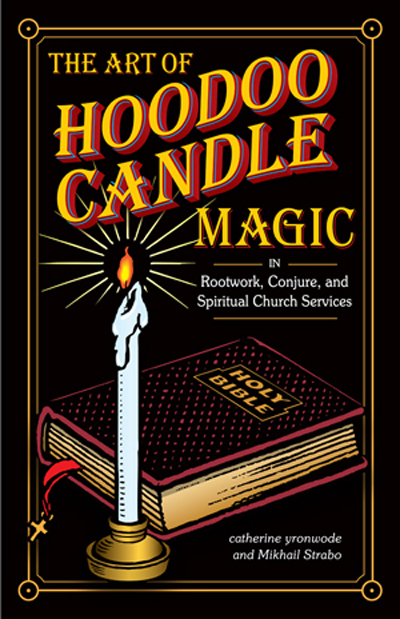 I also read some topics in your book Hoodoo in theory and practice and I could see you mentioned blessing our spells in the name of the Father, Son and Holy Spirit or in Jesus's Name. That is the point, I feel very comfortable doing that, but should I also ask Jesus to bring other spirits along? Do I have to create a connection between me and my ancestors and guides? Or can I work only with Jesus? If you're only comfortable working with Jesus, then do just that! Miss cat provides these videos to her students. Aida is right: the videos titled "Your African American Video of the Day" are a service to my Hoodoo Rootwork Correspondence Course students, particularly the non-Black students. To view the full list and get the links, you would have to be a student of mine. Thank you both. I have actually just completed and received my 4 orders of necessary course supplies and was just doing some reading on the site before I schedule my phone call. I came across the mentioning of the videos and thought they sounded like something I would like to check out. Hopefully I will be accepted as a student and be able to enjoy them all. I plan on calling to set up my phone interview on Monday. Until then have a lovely rest of your week. Is there anything that can be done for actually physically destroying items when you do not know their location... physical destruction of items from afar whether bottles, buried things or plain old items you want destroyed that you cannot get to? People keep posting about things they can't get to to dig up etc... is it possible to do something like this and just in general I feel like this would be really useful.... Does anyone know anything about this? I have heard of spells in other traditions but have NEVER seen them work. You could try by working with just a little bit of gunpowder and destruction candles as well as their other products. Thank you Miss Aida for the information! Very good to know. Almost 14 years ago -- on October 23, 2003 -- i wrote the following post in an old part of the internet known as the Usenet. I recently ran across it again, and i would like to share it. The message is more personal than universal, but it does help explain my online activities from 1994 to the present, a span of 23 years. This was a comment made to another poster who had wondered why there was so much bigotry in the study of magic. African tradition of herb and mineral based natural magic. of magic -- at least not if you consider yourself "white." Jewish Kabbala from Christian Cabala and Hermetic Qabala. The initial mockery of African American folk magic that ran rampant online from 1994 onward has eventually, under the weight of patient explanations, melted away from the social media communities inhabited by online European occultists. Then, primarily between the years 2008 and 2014, a small number of European Americans launched a series of highly inflammatory claims in books and online that hoodoo is nothing but a copy of European American folk magic. They were set down, again with patience, logic, and factual evidence, and i like to think that this forum, started in 2008, played a part in that development. There are now hundreds of web pages offering free information about hoodoo and many people who once knew nothing about African American folk magic are not only aware of it, but are also happy to celebrate its efficacy and its unique style. The silly putty of popular culture demonstrates itself to be fairly malleable and the thorns and barbs folks tossed into it may be blunted and softened through time. It's a testimony to the quality of your writing and the soundness of its basis that its finding online now floats aloft with a resonance of tuned beauty. Thanks! Yes I totally agree with nagasiva. Thanks to your writings and all the information you have made freely available for all to read and hopefully educate themselves, things have changed. As a student of HRCC, I have scoured the whole internet reading and researching everything I could find, and it's very clear that your teachings and writings have made an impact on all the nonsense and bigotry that is out there and so easy to stumble upon. Sadly enough, only recently I removed myself from two Facebook hoodoo and conjure groups, which through their members and admin, portrayed everything that Miss Cat wrote in her post above. But these bigots have a harder task now, trying to spread their nonsense thanks to Miss Cat !! As you already know, I don't follow the groups out on the internet. So, I don't know what's been said or what has happened. My Godparents in Palo and Santeria were elders and are long deceased. And, YOU, catherineyronwode , are my elder, my teacher and my mentor in Hoodoo. I am forever grateful for all that you have taught me and you have my undying respect. And I think the people who mock you and Nagasiva are just terrible, bitter, envious, and jealous for doing so. It enrages me that you have spent so many years dedicated to this practice and dedicated to being a teacher. You have done so much good for the world. And, this is what you get in return? It's DISGUSTING. I am sorry that this has happened to you and Nagasiva. And if you need me to do anything, please let me know. I am a long-time customer of Lucky Mojo. I've had a great deal of notable successes using the products and also the conjure recipes in Cat's (totally awesome) online book and "Hoodoo Herb...". I am very interested in making hoodoo a daily practice. Most magical systems seem to emphasize daily work of some sort. For instance, the Golden Dawn traditions recommend the LBRP and Middle Pillar be performed daily. Do any of the practitioners here have a similar regimen, and if so, which products do you use? Off the top of my head, I would think that Uncrossing, Blessing and Psychic Vision might be good choices. Perhaps Van Van as well? I was thinking of combining my daily meditation and prayer work with lighting some vigil candles dressed with one or all of those oils and possibly burning the respective incense formulas as well. I am also interested in creating an ancestor altar. I believe I read that Hoyt's or Florida Water is good for adding to daily water offerings to the dead. Does anyone else practice anything along these lines? I'm basically looking to create a daily practice that will keep personal luck and (for want of a better term) "energy" strong and also keep me attuned to the spirits, as well as something that will aid the divination work I'm going to be starting. Any help, particularly anecdotes, would be greatly appreciated. You might want to look at page 1 of this thread and see what Miss cat recommends as starters. I see where you are going with this and it's so hard to answer that question s every ingle rootworker does things differently. I like the fact that you are using Psychic Vision because then you are better able to call on your entities for guidance. Smart Move! It's basically, in my opinion, see what works for you and what feels good and see what doesn't. In this reprint of The Ancient book of Formulas, does it have the oil recipes? For instance I see attraction oil x 127, is there a recipe for the oil and what is x 127? I do not know what you mean by "in this reprint of The Ancient book of Formulas." We have never reprinted it. I have a copy of the original and i have posted a FREE transcription online, which you can check yourself. There are indeed recipes in the book. There are no oil recipes such as you hope for, however. The transcription is here and it is free. 1) The book is out of copyright and has been out of print for more than 25 years. 2) I think the title is misleading with respect to "Formulas" and, as someone who bought it long ago, i felt it was worthless to reprint. 3) Because people were always asking me about it, i took the time to make it available for free, to satisfy public curiosity. Are you perhaps confusing this free online transcription of "The Ancient book of Formulas" with another book by the same author, such as "Legends of Incense, Herb, and Oil Magic"? That one we DID reprint. It is filled with information from 1936 on how to work with roots, herbs, talismans, amulets, candles, and seals to perform spells. Thank you very much for the response. I was confused with the two publications and you have cleared that up for me. Great -- and i am glad to have cleared that up! 1. Manufacturing candles in great volume was impossible for slaves.Were candles added to hoodoo practice after the 1800s? 2. I wanted to ask the same about crystals. Where would slaves possibly obtain crystals without being discovered? When was the use of crystals included in Hoodoo practice? Just got the book "Hoodoo Herb and Root Magic" but haven't really read it thoroughly as of yet. Before i get to your numbered questions, i want you to understand that hoodoo entered America with the African slaves, but it is African American now. In other words, it is not a perfect preservation of African folk magic. Just as jazz is an African American phenomenon of African melodies, scales, and rhythms played on European instruments, so is hoodoo a phenomenon of African folk magic with roots, herbs, flame, liquids, and minerals worked with European tools and ingredients. Hoodoo as we know it -- and jazz as we know it -- developed primarily after Emancipation. Hoodoo would not exist were it not for African slaves retaining, using, and passing down their ancestral knowledge -- but it would not look like what it is now if it had remained purely African. 1. Candles are old but not ancient. Slaves who were employed as chandlers for ships would have had access to them, but in actual practice, most homes during that era employed lamps, not candles. Candles were more popular on ships, because they could not spill out of a container on the rolling seas. We still use lamps in hoodoo, by the way, even though few people light their home with lamps -- or with candles. Mineral crystal salts are natural substances. Salt, Saltpeter, Epsom Salts, Washing Soda, and Alum, to name but a few, have been mined and refined in every part of the word since prehistoric times and have found numerous uses in the preparation of food, toiletries, as well as in agriculture and diverse industries. Depending upon which crystal you are referring to, the answer to your question would go back to ancient Africa -- but also ancient Europe, ancient Asia, and the ancient Americas. If, however, you are referring only to scented crystal salts for sprinkling or bathing, i think those must date back at least to the 1700s when the perfuming of toiletries became more common. 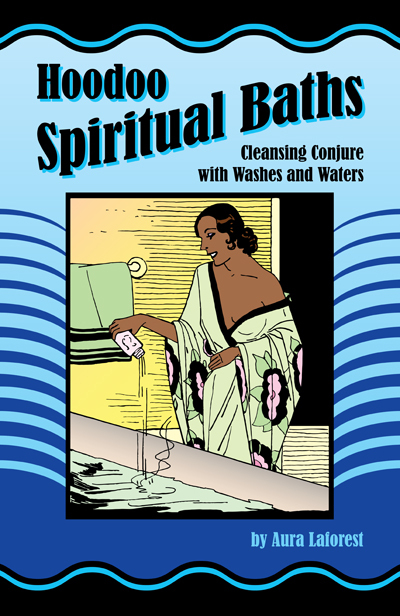 The employment of mineral crystals salts of various sorts has been documented in the practice of hoodoo as far back as the records go. Finally, if you are referring to hard and durable minerals that form non-soluble crystals in the earth, such as quartz or garnet, well, those are found everywhere on earth. Their use in magic was fairly common around the Mediterranean and in South Asia in Classical times, and the historical record of their use in Africa is scant. 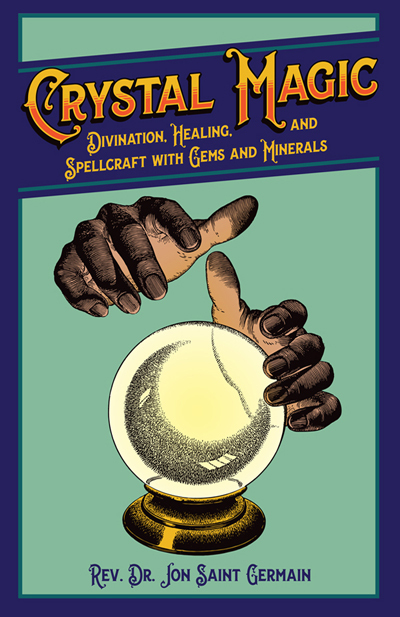 However, to give but one example of their early use in hoodoo, the African American diviner, spiritualist, and root doctor Paschal Beverly Randolph, who lived from 1825 to 1875 describes his use of an emerald crystal for scrying and fortune telling. He was a Free Person of Color, born in Virginia, and in his younger years he took employment on merchant ships, voyaging all over the world and meeting many people in order to learn their practices of folk magic His emerald was a gift from an Indian ruler who was visiting in England while he was there. This was before the Civil War, as i understand it. He wrote a book describing its use in the 1970s. So, there you go -- the first use of a gemstone crystal that i have encountered in hoodoo. Other documented early adopters came after Emancipation -- folks like Dr. Jim Jordan of North Carolina, for instance. By the 1920s, Patrick County Fairy Crosses were being offered in hoodoo shops all over the country. I hope this was the information you are looking for. Hi there! Before I get into any details about concerns with my Housing situation I'd be interested in learning what this forum knows about occult work and the law as in do occult facts, deeds, interests, background ever enter in the Courts? Thanks! Du buerre! Donnez-moi du buerre! Toujour-du buerre! The courts generally treat occultism as an offshoot of religion or spirituality. This is not a general occult forum, by the way. It is the customer service desk for the Lucky Mojo Curio Company. Thank you! Yes I'm familiarizing myself with forum guidelines. Hello all. I feel lucky to have found this site as there is a wealth of information on here as well as a mentorship program that I may have to participate in sometime in the future. I made this post because I saw a youtube video by a man that practices Haitan Voodoo. I would post the video, but I don't know how at the moment. In the video he went on a rant about people that build altars, do work, etc..... when they don't really know what they are doing. According to him it can be extremely dangerous. With that said, I was wondering if this could be a thread where many of the veteran hoodoo practitioners could list all the possible dangers to oneself of practicing this craft, and what these dangers are related to, when you don't know what you are doing, whether it is spells, altars, etc.... and how to play with fire and not get BURNED!!!!! I have moved your question to its appropriate location. it must be stated that Hoodoo is not Voodoo and therefore is not subject to any "rules" that may be observed in the Voodoo religion. Is it "dangerous" to perform rootwork as a newbie? I would say that there is no danger in the way I think you mean it. On the one hand I beleive that doing anything that you have no experience with has the potential to be "dangerous" simply because of ignorance, lack of knowledge about whatever that thing is. On the other hand, however, how do you learn if you never try? I would say that working with spirits of the dead could be something to concern yourself with if you are not well informed but this is not unique to Hoodoo. The "dangers" one might encounter in Conjure would be, in my estimation, things in the mundane realm like fire hazards and little to no results because of sloppy work. In the spiritual realm you may find that you get what you ask for so if you are not clear about your desires this could work against you. What a great reply, Dr. Darensbourg! I could not have said that better, or more patiently, myself. Thank you. If you are familiar with the Christian religion -- which is the religion ascribed to by the majority (but not all) of the tens of thousands of contemporary conjure, rootwork, and hoodoo home practitioners and professionals -- you would know that the most "dangerous" aspects of religion are lack of faith and the wrongful assumption of authoritarian power. In many cases it has been my experience that those who tell you that their religion is "dangerous" or must only be practiced by those who are "licensed" are speaking from a clerical position of authority, which you, as a being of free will, are free to adhere to or ignore. Protestant Christianity, in particular, while it does endorse and uphold the concept of anointed pastors and deacons, is also built upon one's personal faith and connection to God, Jesus, and Spirit. World-wide folk magic, on the other hand, and i include hoodoo in that, is not a religion, but a domestic tradition, often passed down among family members, between friends, from vendor to customer, and also through published grimoires or spell books, some of which (for instance in Jewish folk magic) date back many centuries. Folk magic is accessible to all. To understand any particular system of folk magic best, you will need to know the culture it arose in, to be open to and accepting of the depth and breadth of that culture, and to befriend people born into that culture. Hoodoo is African American folk magic, so making Black friends and studying Black folk culture is your first step on the path to practicing Black folk magic. Well, thank you for the replies.